Danny is only five years old, but in the words of old Mr Hallorann he is a 'shiner', aglow with psychic voltage. 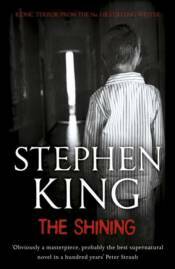 When his father becomes caretaker of the Overlook Hotel, Danny's visions grow out of control.As winter closes in and blizzards cut them off, the hotel seems to develop a life of its own. It is meant to be empty. So who is the lady in Room 217 and who are the masked guests going up and down in the elevator? And why do the hedges shaped like animals seem so alive?Somewhere, somehow, there is an evil force in the hotel - and that, too, is beginning to shine... About the AuthorStephen King has written some forty books and novellas, including Carrie, The Stand And Rita Hayworth And Shawshank Redemption (from the collection Different Seasons), Bag Of Bones, On Writing and most recently Cell, Lisey's Story And Duma Key. He wrote several novels under the pseudonym of Richard Bachman, including BLAZE (June 2007). He won America's prestigious National Book Award and was voted Grand Master in the 2007 Edgar Allen Poe awards. He lives with his wife, novelist Tabitha King, in Maine, USA.